Home Battery Storage Is Here For Australian Solar Houses. Go Lithium! ffs are disappearing, our systems allow you to get a full return on your solar power investment and maximize your savings. Our solar storage systems will also give you the comfort of knowing your energy supply is secure even during blackout periods when grid power is unavailable. Below you will find more information on the system and also a photo of a recent installation for an example. 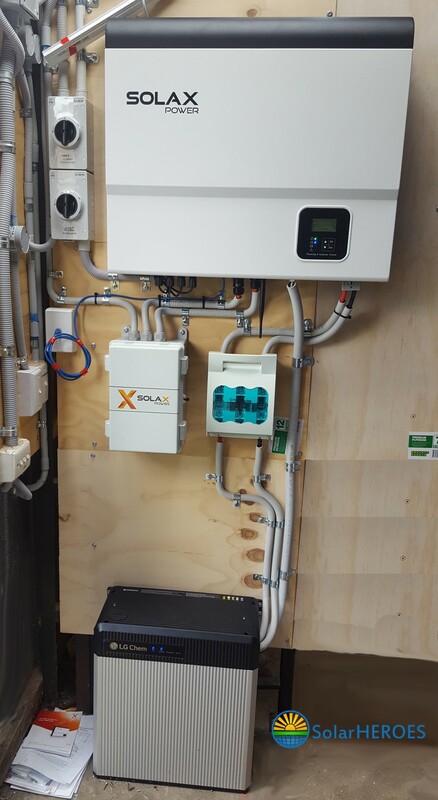 For pricing and further advice on our grid connected with battery storage systems, see this link https://www.solarheroes.com.au/solar-installation-costs-and-advice/. We also offer Off Grid systems and grid connect systems which can be found on the top of this page under our Packages tab. Monitor your solar system and batteries from any mobile device including smart phones and tablets. The inverter will send live and historical data to the software that allows you to access remotely over the internet. You will never be without the comfort of knowing the state of your home solar system. The software is very easy to use and has plenty of options to be programmed. Below you will see historical price rise charts showing how the cost of electricity in Australia increases dramatically year on year. It is crucial to understand that this forever increasing trend will continue for years to come. Below is a summary of the price rises in just one year. Tell us if you need your current system retrofitted or if you need a complete system by calling us today.